Women Against Abuse has been named as the winner of the 2017 Barry & Marie Lipman Family Prize. Chosen from more than 100 applicants around the globe, the organization is Philadelphia’s leading domestic violence service provider and advocacy organization, and one of the largest in the U.S.
Women Against Abuse will receive $250,000 in unrestricted funds. Honorees We Care Solar and Seeding Labs will receive $50,000 each. All three organizations will also receive executive training and support from the Wharton School and the University of Pennsylvania. 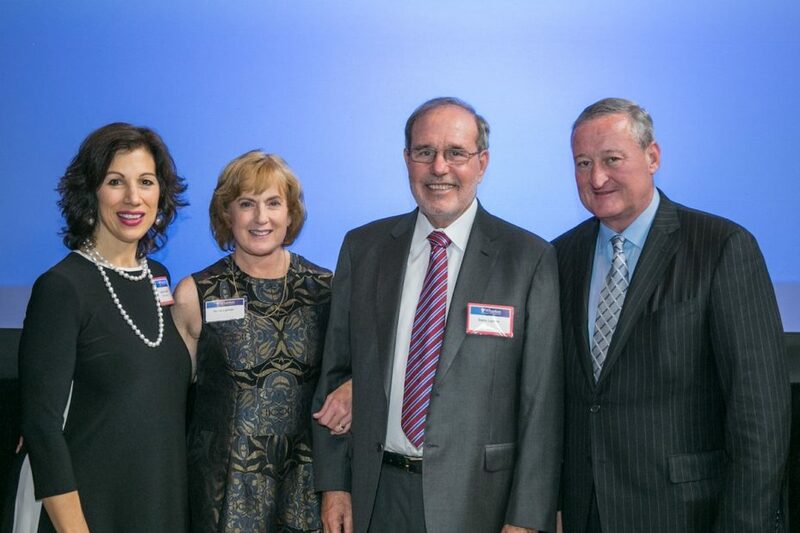 Women Against Abuse Executive Director and President Jeannine L. Lisitski with Marie and Barry Lipman, W’70, and Mayor Jim Kenney at the 2017 Lipman Family Prize awards ceremony. Founded in the late 1970s by two hospital social workers, Women Against Abuse provides a continuum of care — from telephone crisis counseling to long-term supportive housing — for people experiencing intimate partner violence. The organization is being honored with the Lipman Family Prize for its role in pioneering Shared Safety, Philadelphia’s coordinated community response to relational violence — encompassing domestic violence, reproductive coercion and trafficking. Initiated in 2015, Shared Safety brings together dozens of public, private, and nonprofit stakeholders to address domestic violence systemically — via human services, health care, housing support, and trauma-related treatment — rather than relegating it to the criminal justice system alone. Women Against Abuse and Philadelphia’s Department of Behavioral Health are Shared Safety’s “backbone” organizations. In addition to the $250,000 financial prize, which is offered to the winner without restrictions, all three Lipman Family Prize honorees gain access to a growing network of changemakers and thought leaders to accelerate cutting-edge change worldwide. The Prize connects those on the cusp of great change with resources, skills and people-power to expand the impact and influence of their ideas. Benefits include an executive education program, an exclusive opportunity to apply for the Lipman Nonprofit Leadership Scholarship, pro-bono consultation from University faculty and staff, peer learning events, as well as expert- and student-driven research to inform and guide their work. We Care Solar makes portable, cost-effective solar suitcases that power critical lighting, mobile communication devices and medical devices in low-resource areas without reliable electricity. The Berkeley-based organization was co-founded in 2010 by Laura Stachel, MD, MPH, who serves as Executive Director. Seeding Labs helps talented scientists in developing countries conduct life-changing research by equipping them with the tools, training and connections they need to be on the cutting edge of global discovery. The Boston-based nonprofit was formally launched in 2007 by Nina Dudnik, PhD, who serves as Chief Executive Officer. In this podcast from Leadership in Action, Barry Lipman talks about why he and Marie created the prize.